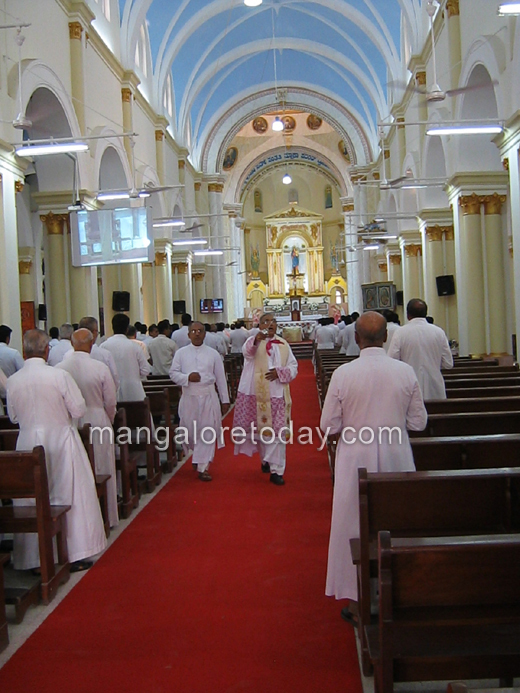 Mangaluru, March 27, 2015: On March 26,2015, the main church of the Mangaluru diocese and seat of the Bishop, Rosario Cathedral, at 5 PM hosted the Diocese of Mangalore’s solemn blessing Holy Oils, during a special mass lead by Bishop of Mangalore Rev Dr Aloysius Paul D’Souza. The Day is also observed as ’DAY of PRIESTS’. 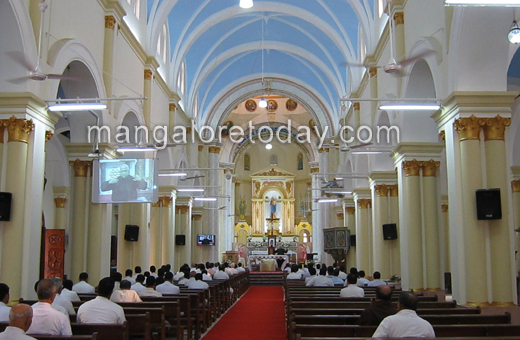 A large compliment of Priests, deacons, seminarians, nuns,religious and the laity attended. On this occasion, the newly redecorated and refurbished Rosario Cathedral, which is now completing a century of it’s building at this spot was opened after a 3 month closure to complete the wide spread work on the interior and exterior of the church. Last year 2014 saw the entire roof of this Cathedral redone. 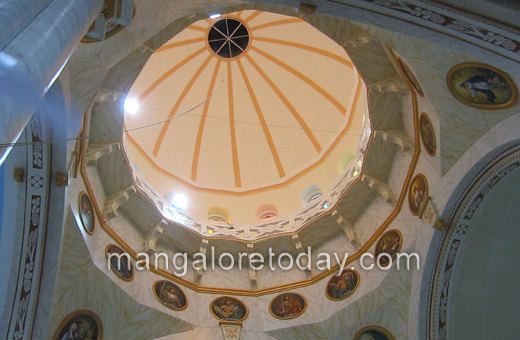 The interior of thew church ha sbeen very tastefully and soberly redone and the tabernacle, alter, dome, sanctuary and so on redecorated tastefully. New infrastructure like electrical, audiovisuals and so on have been updated and provided anew. Before the mass, the priests present were exhorted to renew their ministry to the people in manner that Christ has prescribed and the Pope Francis has laid down. 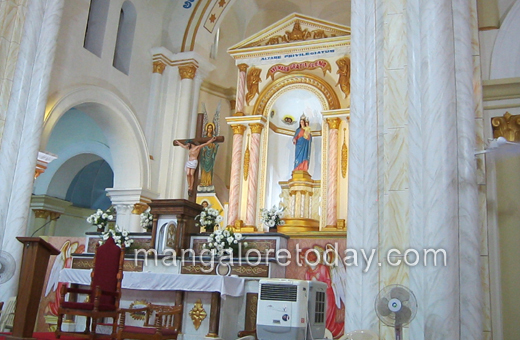 The church was blessed as per rituals by the Bishop assisted by the Vicar General and Parish Priest Fr.J B Crasta who was responsible along with his confreres and councils for the very appreciable work done. 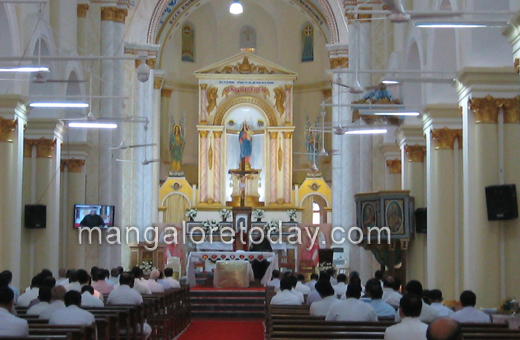 There was a special ’Aradhana’ after the blessing of the church. 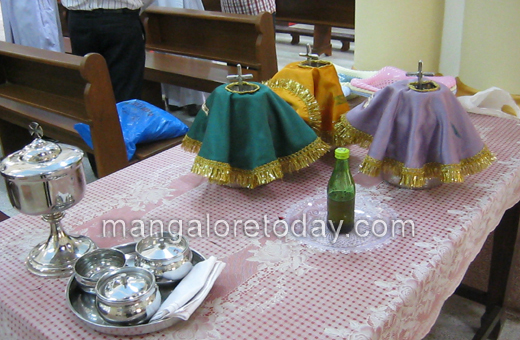 Chrism (Greek word literally meaning "an anointing"), "Consecrated Oil", is used in the Roman Catholic, Eastern Orthodox, Anglican, Eastern Rite Catholic, Oriental Orthodox, and Old-Catholic churches, as well as some other traditions, including the Assyrian Church of the East, and Nordic-style Lutheran churches, in the administration of certain sacraments and ecclesiastical functions. Pure or scented olive oil, although typically not called chrism today, has been called chrism in the past, including oil used by Protestants in some forms of Baptism, Confirmation, Anointing of the Sick and foot washing and in other religious needs as decided by a concerned authority. 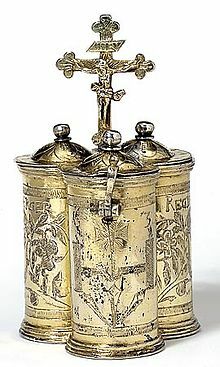 Chrismatory for ritual oil from Germany, 1636. Glass ambry containing vessels for holy oil: chrism, oil of catechumens, and the for the anointing of the sick. Chrism is essential for the Catholic Sacrament of Confirmation/Chrismation, and is prominently used in the sacraments of Baptism and Holy Orders. Those to be confirmed or chrismated, after receiving the laying on of hands, are anointed on the head by the bishop or priest. In baptism, if the person baptized is not to be immediately confirmed or chrismated, the minister anoints them with chrism. Newly ordained priests are anointed with chrism on the palms of their hands, and newly ordained bishops receive an anointing of chrism on their foreheads. It is also used in the consecration of objects such as churches and altars and holy vessels used in churches. These holy oils are usually stored in special vessels known as chrismaria and kept in a cabinet known as an ambry. 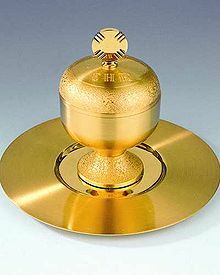 When the oils are distributed to a priest for him to use in his ministry they are kept in a smaller vessel with three compartments, known as an "oil stock". The aim of the church is to give solace and support to those who seek for the welfare of the body and spirit. This ritual is followed in all diocese the world over.